An aquarium based on keys or Caribbean species would be ideal for the many species of interesting and attractive macroalgae available to hobbyists. For the calcium-loving calcareous types, the tank should have a layer of substrate; the upper layer of a live sand bed is satisfactory, perhaps making it a bit thicker than an inch here and there, to better support these algae, which are rooted in the substrate by a holdfast. Penicillus, Rhipocephalus, Udotea and Halimeda incrassata are typical and often occur together in the lagoon. Halimeda opuntia and Cymopolia bar-bata are not usually rooted in the substrate but are attached to rocks or simply lie on the bottom. 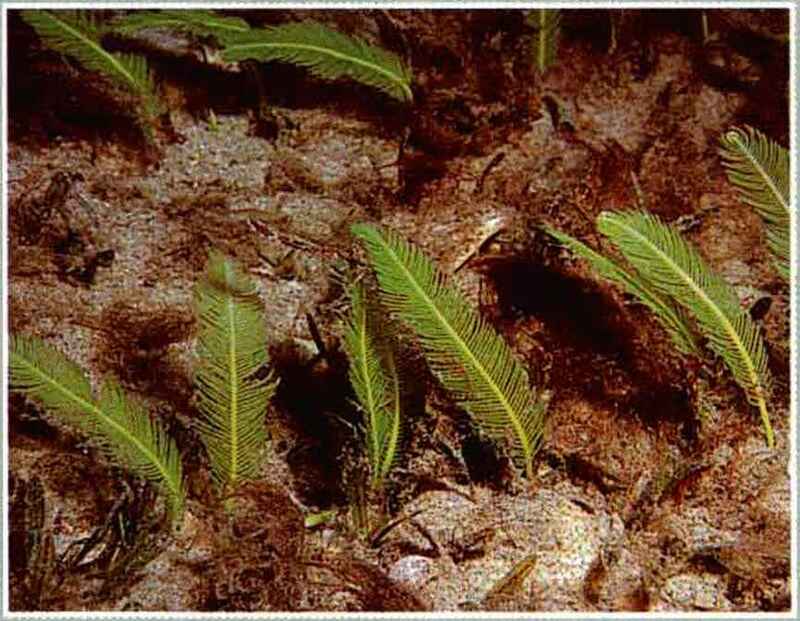 Macroalgae reach their greatest diversity and abundance in shallow habitats with a sandy or muddy bottom. Inshore habitats, too, may harbor all the species just mentioned, along with many more, including various forms of Caulerpa. The latter is not calcified, and leaks organic matter into the water, so the aquarium housing it needs adequate skimming. Soft corals of the more tolerant varieties, such as Sarcophyton, mushroom polyps, and LPS (large-polyped scleractinian) corals, such as Trachyphyllia, are at home in a habitat with abundant, noncalcified seaweeds, but SPS (small-polyped scleractinian) corals would not be appropriate. A dense growth of macroalgae dominated by Caulerpa also comes close to duplicating a patch denuded of Turtle Grass and sub sequently recolonized by the more rapidly growing macroalgae. This is analogous to what happens in a forest when fire destroys a tract of trees. Fast-growing, opportunistic species appear quickly and dominate for a while, but the old growth trees eventually return to prominence. This is also true of Turtle Grass, so an aquarium built around this theme can have another facet of interest, that of capturing a microhabitat at a specific "moment" in time. The single most important requirement for the cultivation of macroalgae is sufficient light. Refer to Chapter Four for information regarding selection of artificial lighting systems for the aquarium. The optimum light intensity for shallow-water tropical macroalgae is about 16,000 lux (Spotte, 1979). For large-scale algae production, greenhouse culture is probably the most economical route. plement to maintain a concentration of 0.05 to 0.1 mg/L. Iodine supplements should also be used (see Chapter Twelve for more information on supplements). Algae that have calcareous skeletons are especially sensitive to pH, alkalinity, and calcium concentration. Some fishes and invertebrates are not compatible with macroalgae. Tangs, angelfishes, sea urchins, and many mol-lusks will readily consume a carefully tended underwater garden. A pair of seahorses would be suitable and quite at home in a seaweed-dominated aquarium environment but are notoriously difficult to maintain in captivity. A better choice, for an Indo-Pacific environment, would be one or more gobies íGobiodon spp.) or wrasses CHalichoeres spp.). For a biologically accurate macroalgae tank from Florida or the Caribbean, consider including any of the species mentioned in this chapter that are recommended for the lagoon or seagrass habitats. Aquarists are sometimes told that macroalgae are to be avoided because they will invariably die and release harmful compounds into the water, spelling disaster for all of the tank's other inhabitants. This notion is a mix of both fact and fiction. In the first place, apparently only Caulerpa species experience mass die-off with any regularity. This phenomenon is associated with the reproductive cycle, or sporulation, of the algae. I have seen it occur only once with a species other than a member of the Caulerpa genus; in that instance, the species was Hallmeda discoidea. In any case, sporulation can be avoided by proper maintenance techniques. It appears that iron depletion (which would never occur in the sea), and lack of regular pruning (which naturally occurs as a result of nibbling by herbivores) may trigger sporulation. As to the assertion that harmful compounds are released, again, this is only partly true. 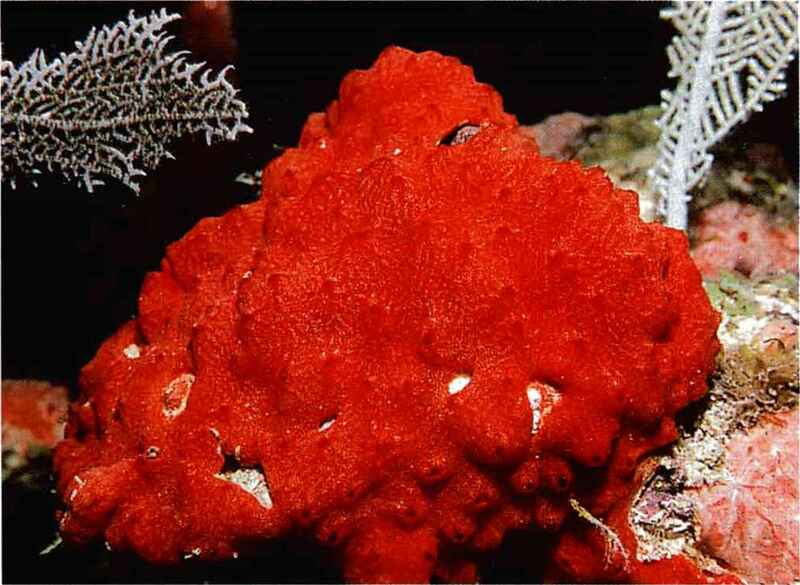 Macroalgae may indeed produce poisonous alkaloids to deter other organisms from feeding upon them, and the death and decay of any organism will create pollution in the aquarium if the system's capacity is overloaded. However, these phenomena may not be responsible for the disastrous effects upon the other specimens in the tank following a sporulation event by Caulerpa. I suspect that the most likely problem is oxygen depletion. The spore of Caulerpa is a free-swimming organism that may be considered analogous to a mammalian sperm cell. It swims vigorously by means of a whiplike appendage, the fla-gellum. This activity demands plenty of oxygen. Since literally millions of these spores may be released at once, enough to tint the water green, oxygen depletion can occur, and fish and other organisms may die as a result. Another problem that may develop in an aquarium with abundant macroalgae is an elevated pH. This occurs as the growing algae remove carbon dioxide from the water for photosynthesis. Vigorous aeration for increased gas exchange, or control of pH with an automated carbon dioxide injection system, may be necessary. Macroalgae reward the careful aquarist with the lush, green color of chlorophyll and a beautiful diversity of forms. 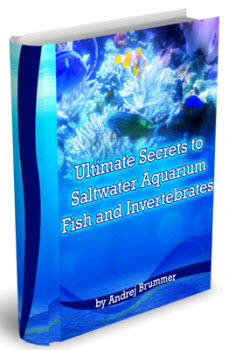 Wisely chosen and properly grown, they are appropriate additions to any natural reef aquarium. 172 Natural Reef Aquariums calcium carbonate skeleton and those that do not. The calcareous varieties are among the most interesting and beautiful macroalgae. This group includes the various species of Halimeda, which are found in shallow-water habitats as well as on the reef. The appearance of Merman's Shaving Brush (Penicillus capitatus and P. dumetosus) is adequately described by its common name. Green Sea Fan is the name most frequently given to Udotea. Two species are available, U. spin-ulosa, a flattened form, and U. cyathiformis, in which the fan is curved, almost cone-shaped. Sea Paintbrush or Pinecone Shaving Brush are two common names that describe the appearance of Rhipocephalusphoenix. Dictyota is a member of the brown algae phylum (Phaeophyta). Its golden-brown fronds divide repeatedly, producing a loose clump held upright above the point of attachment. Dictyota is probably the most commonly seen member of the brown algae family in collections made for the aquarium. Its "cousin" Sargassum is only occasionally collected and is rather difficult to cultivate. One other brown alga genus deserves mention. This is Padina, which must be obtained attached to a rock if there is to be any hope of keeping it alive. It is abundant in inshore waters, where it forms clumps of ruffled, fan-shaped blades attached to rocks and rubble. The blades are golden-brown in color, with alternating bands of bright yellow-green. It is an attractive species that sometimes does not retain its banded appearance in the aquarium. All brown algae appear to benefit from additions of iodine, and Padina is no exception. My favorite calcareous macroalga is one of the Chloro-phyta, Cymopolia barbata. It looks like branched strings of white beads with a tuft of green filaments forming a "pompom" at the tip of each branch. All of the calcareous macroalgae grow best if obtained attached to a rock, although some may also grow in loose, sandy substrates. Each of the species mentioned above has an upright stalk with a rootlike structure, the holdfast, at the lower end. The hold fast anchors the plant in the substrate or to a hard surface but does not function in the assimilation of nutrients, as the roots of terrestrial plants do. Calcareous algae with the holdfast missing will not survive for long. All of these calcareous macroalgae can be included in an aquarium mimicking the gorgonian forest. Spreading on live rock, compound tunicates appear in many colors and forms and are often misidentified as sponges. How to cultivate live rock to color rock? What color are aquarium live rock?